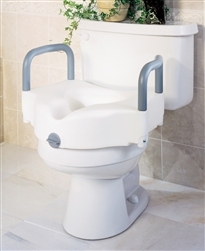 Guardian Locking Raised Toilet Seat with Arms provides a 5” raised toilet seat. This makes using the toilet easier for those with troubles bending. It has a weight capacity of 250-pounds. The Medline Raised toilet seat is designed for standard bowls.